Semi-Auto Miter Cutting Band Saws, Automatic Miter Cutting Band Saws - Big Stone Machinery Co., Ltd.
As a professional manufacture of band saw machine, Big Stone has been engaged in this line without any hesitation of proceeding the quality and service to the whole international market. 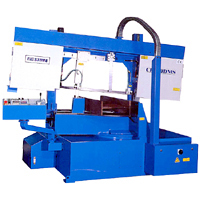 For being known in the competitive market, we are doing the most effort in organization, development, products and the range of the machines...etc that you shall trust the honesty here inside our concentration on the cutting accuracy. In addition to produce normal fully automatic column type band saw with capacity 260mm-600mm, we also produce semi-automatic/automatic miter cutting band saw with capacity 400mm-800mm(W) that a good reputation has been enjoyed in Europe, America, Asia and Australia...etc. The wide range provides you the space of different choices! Come and enquiry us!